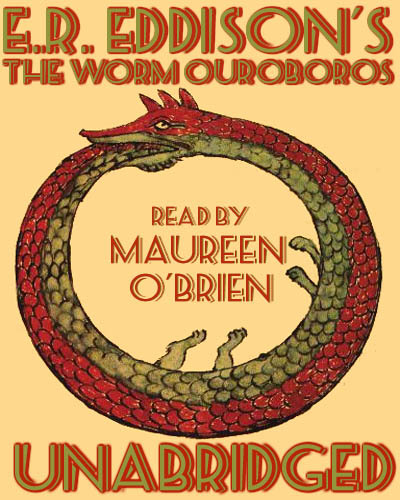 Scott A. Cupp called The Worm Ouroboros “a fantasy that is as fascinating as Tolkien and much more brilliant.” Tolkien himself had read The Worm Ouroboros before writing The Lord Of The Rings. Tolkien’s Middle Earth books use a more grounded prose style than Eddison. Bear in mind that Eddison’s archaic language makes his High Fantasy far less accessible than Tolkien. Maureen Obrien has released her reading of it under a Creative Commons license. Awesome, thanks Jesse, and I must commend Maureen for completing this daunting task. Now I can listen to The Worm in the car on the way to work! Thanks for finding this! I heard of this novel many years ago, and have wanted to read it ever since. Now that it’s available in audio I’ll finally be able to do so with ease. Thank you kindly for the mention! I have to say that I don’t think I did full justice to most of the characters. Seriously, this is a book that really would benefit by a full cast, preferably of Shakespearean actors. So please don’t be put off the book itself by any bad voicing of characters on my part. But I did find that such a sprawling book with such unique use of language seemed to benefit from being read out loud. I hope everyone enjoys it.